Disclosure: This post also includes affiliate links, which come at no cost to you. When you click on these links and purchase something, I receive a small compensation, which helps to keep C+B running! Additionally, I did not receive compensation from ThirdLove, but I tried their 30 day trial of their t-shirt bra and now I’m absolutely love with them! Summer is approaching quickly and I’m feeling somewhat excited about it. While I’m definitely more of a Fall fan to be honest, one of the things that I love about summer is the fashion. It’s all about maxi dresses, trendy blouses, and off-the-shoulder tops and I am loving it. However, with all of these wonderful outfits being purchased for the summer, it’s important that you’re pairing the right bra with. It’s kind of like how people pair wine and food. There’s certain foods that compliment well while others don’t enhance the flavor much. Similarly, you could have the cutest top that flatters you so well, wear the wrong bra with it and now it messes it up. You could have a top that is totally appropriate for the work place and accidentally wear a neon-colored bra under a white blouse. In lieu of that, I thought it would be fun to not only share some of my favorite looks for summer, but also some accessories that would pair really nicely with them. Of all of the styles that they’re bringing back, I’m so excited that off-the-shoulder tops and dresses are becoming a trendy thing, again. I’m one that believes that off-the-shoulder tops are flattering on everyone and is perfect for these upcoming summer months. In fact, I own quite a few of them, including an off-the-shoulder top with tassels on the end – another trend I am loving! I like to pair these up with with a nice pair of sandals or wedges for a date night look! 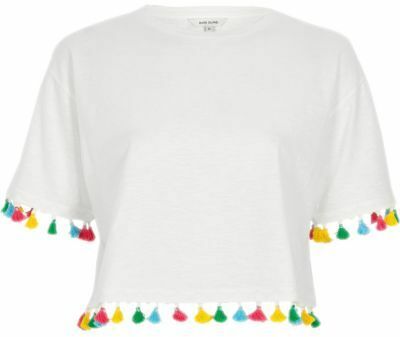 Speaking of tassels, I am in love this trend and the fact that it’s a thing. One of the things that makes this look so perfect for summer is that it’s so brightly colored. I believe colorful tassels add a unique flair to outfits and add personality to dresses and shirts. I also may or may not feel tempted while wearing these to break out in song and shimmy just to watch the tassels move like I’m Tina Turner rocking one of her staple dresses. Not only are they super trendy, but word on the street is that they’re also really easy to DIY. I’d pair this particular top from River Island with a knee-length, high-waisted pencil skirt and sandals for a relaxed summer look! Flowy dresses – especially midis are usually a nice happy medium for me. Plus something about them feels so whimsical and free. That’s why I love dresses like these! Pair them with a pair of flat or heeled sandals and you’re good to go, girl! I love a-line tops and peplums! I feel they’re so flattering on everyone and feel so comfortable on. Along with my off-the-shoulder tops and dresses, I own quite a few peplums and a-line tops for that reason. What I love about this particular top from Derek Lam is that you can style them and accessorize them as you please and it still doesn’t take away from the top. I think tops like these would go nicely with shorts, jeans, or a midi-skirt! Well, that’s it for my favorite summer looks and the accessories, I’d recommend pairing with them. I recently shared my experience trying ThirdLove for the first time on the blog. If you’re interested in learning more about their products, feel free to check out my review as well as tips for identifying whether you’re wearing the wrong bra or not, here. What are some of your favorite things to wear during the summer?